Life-changing Prayer for Men Series. 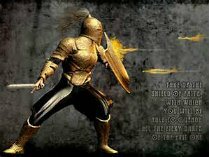 Today, I will put on your Mighty Armor. that God wants me to enjoy. Fills me with God's Power. with him and with his Word. I will pick up the Shield of Faith. the evil thoughts that the devil throws at me. Bring me Renewed Life and Strength. for teaching how to live right." I will become a Strong Man of God. Pray for God’s protection over my family. help my family live by God's Word. I am called to make godly, right choices in my life. help my family to grow more like Jesus. I am called to bring a godly peace and kindness into my home. I will not give in to temptation. I will not listen to ungodly talk. Awesome Power of God Almighty! who leads his family toward God.